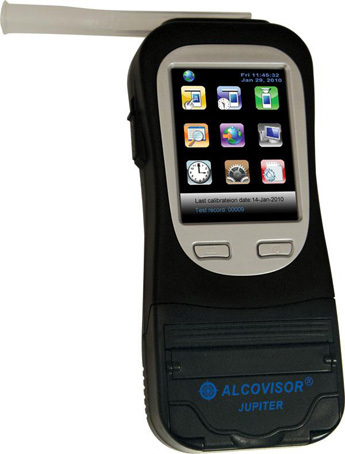 The Superb Alcovisor BAC-100 Jupiter is the World's first hand held fuel cell alcohol detector, LCD colour touchscreen breathalyser and printer combined together. This is a superb model for employee screening/testing where a hard print out test result is required but where the expense of a Draeger 6810/Printer combination is outside the budget. You can save approximately £900 on a Drager/Printer Combination. This unit offers Police grade accuracy at a fantastic price. Easy to use, up and running in seconds and no training required. The New BAC100 Jupiter features the same internal sensor as used in some UK issue Police devices but has a superb full colour touch screen TFT menu display which is very easy to use and offers the user many features not available on the older BAC100. It has the unique ability to take a Police grade breath test and then print the result off within 15 seconds. 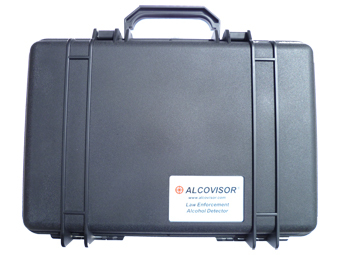 It has now passed and carries full approval as an evidential breathalyzer having recently passed the strict and tough testing regime under The National Highways Traffic Safety Administartion (NHTSA). 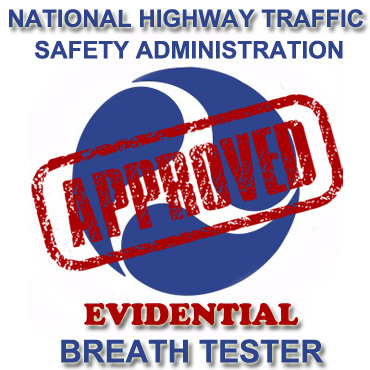 Only the very best (accurate) breathalyzers carry this approval. 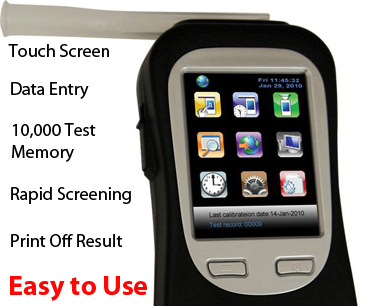 The BAC100 is approved and in full use for evidential testing with Police Forces all over the World. Flow rate and blow time error technology, print copy adjection, ability to key in all information which the user may need, step by step operating indications. The Jupiter also offers both direct and passive sampling. (A sample can be taken without a subject blowing into the unit, although less accurate than normal sampling methods). Fuel Cell: The UK manufactured fuel cell offers exceptional accuracy and a long stable lifespan. The fuel cell has a response which is linear and directly proportional to Breath Alcohol Concentration (BrAC). Having a high specificity to alcohol, the fuel cell is not influenced by acetone or other breath substances. Digital Touchscreen Keyboard: The Jupiter has a unique outstanding feature which other competitive models do not provide. It has a fully integrated colour touchscreen keyboard for data entry. The input digital keyboard is a standard keyboard for data input. The Alcotector will automatically store 10,000 tests. Internal Printer : A thermal printer is combined with the detector. The printer function, provides the time and dates of alcohol tests, the alcohol concentration (BrAC), names, location, vehicle identification (if required) , subject, driver license number (if required), breath test operator (if required), and the serial number of the Alcotector for later use in court/tribunals if required. It is normally set up to the UK Police standard of ug/100ml - UK limit will display as 35 but this can be changed very easily if required. It can be used in any country. Breath sampling time Up to 4 s continuous breath.